There is no way this one will not be massive. After a huge R Kelly Tribute and an equally big xmas ball, this time we are paying homage to the works The Neptunes. 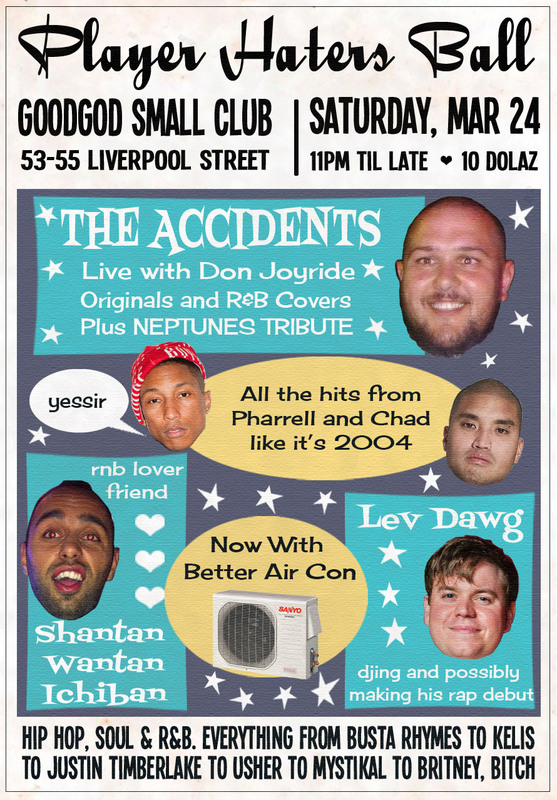 The Accidents, led by the Samoan John Legend, Don Joyride, will perform two sets. The first a mix of covers and originals. The second set will be pure Pharrell and Chad bangers from N*E*R*D* to Usher to Justin Timberlake to Britney and so much more. Any Neptunes jams missed by The Accidents will definitely be played by Levins, Shantan Wantan Ichiban and Joyride when they each serve up some Hip Hop, R&B and Soul goodies on the turntables. Each of these parties has been a sweaty night of loose dancing and folks getting it on with each other. I don’t expect this one to be any different. Here are a few tunes that will definitely get a play. This entry was posted in Events, Freeloads and tagged covers, dj joyride, goodgod small club, hip hop, levins, march 24, neptunes tribute, player haters ball, rnb soul, saturday, shantan wantan ichiban, the accidents. Bookmark the permalink.